Asthma severity can be affected by several indoor and outdoor conditions, including dust and microbes. In a paper that came out last week in Indoor Air, researchers from Yale University applied NextGen DNA sequencing to characterize the bacterial and fungal communities in house-dust sampled from nearly 200 homes of asthmatic children in southern New England. Dust was collected from couch and floor surfaces in the main living area using a special vacuum cleaner. After DNA extraction, fungi and bacterial communities were amplified and sequenced (454 Titanium technology for the fungal amplicons and Ion Torrent for the bacterial fragments). The most abundant fungal species found in these dust samples were Leptosphaerulina chartarum, Epicoccum nigrum, and Wallemia sebi. Not surprisingly, the most abundant bacterial families were Staphylococcaceae, Streptococcaceae, and Corynebacteriaceae, taxa commonly found on human skin. Higher concentrations of human cells in the dust were associated with higher abundance of human human-associated fungi, such as Malassezia spp., and human-associated bacteria such as Rothia mucilaginosa, Streptococcus, Corynebacterium, and Staphylococcus. More fungal species were found in houses with pets, and higher humidity (water leaks, less use of AC unit). 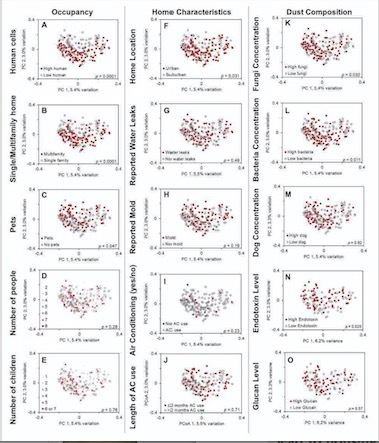 Bacterial richness was higher in houses with pets and in suburban areas. In addition, bacterial composition was associated with high human occupancy and presence of pets. 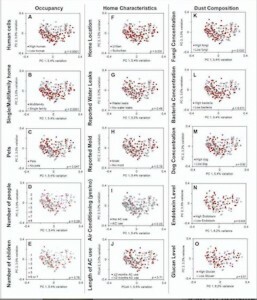 So no major surprises here, but it was nice to see correlations between household characteristics and microbial communities. A major limitation is that the study only included households with a child with asthma, so there was no comparison possible to homes with healthy children. In addition, as noted by the authors, a high fungal richness might be protective against the development of asthma development, so the number of fungal species in these houses might actually be lower than those without asthmatic children. I would also have liked to see a correlation between the severity of asthma and dust microbial composition, which would have been a great addition. Finally, I would have preferred to see the PCoA plots that are currently in the supplemental materials in the main text, instead of the current tables and bar graphs. But that is maybe just my personal preference. All in all, a nice study to add to our knowledge of fungi and bacterial communities in indoor air, that would have been stronger if it had included homes from children without asthma.